PAN Verification Error | Update KYC Details Online | EPF UAN Portal | UAN Error – Pan Verification Has Failed | December 2018 – What to do when you upload KYC (PAN Card Details) in EPF UAN Portal but you get an unexpected error that Verification of PAN is failed “Name against UAN does not match with the Name in Income Tax Department”. EPFO gives many flexibilities to their members and one of them is that the members can update their PAN details or information by using UAN portal provided by EPFO. So, If someone wants to update or correct their PAN details on UAN EPFO portal, The UAN (Universal Account Number) credential is a most important. One can login to EPFO UAN portal and update Their given PAN details by uploading necessary documents online. Nowadays, The EPF subscribers coming up with an issue that they are getting an unexpected PAN verification failed error while they try to upload their KYC Details in EPF unified portal like PAN Card Details. Before solving this issue, let’s know how and why this error showing everytime you upload your PAN detail. The members have to understand that they get this error because of wrong named registered with their EPFO database, so they have to update their name entered in EPF UAN Portal first. In order to update/correct the registered name in EPFO database, the only thing is to fill & submit EPF Joint Declaration Form. 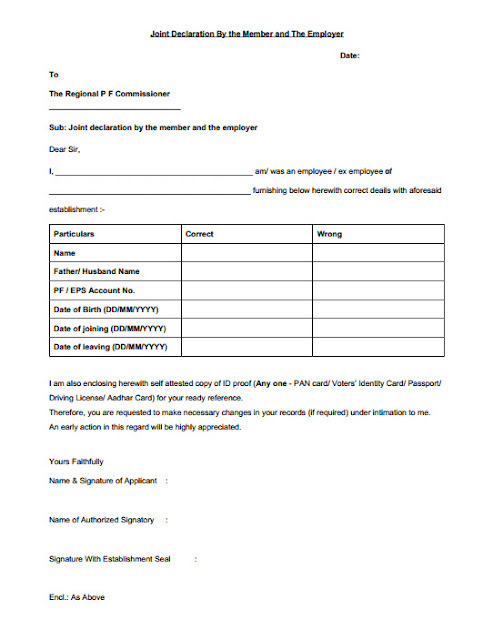 While filling the EPF joint declaration form the member has to mention his/her wrong as well as the correct name after that the member should take that form to his/her employer for attestation process and after that, submit the attested form along with employer’s name correction request letter to your regional EPF office. The time period to update the same is at least 30 days. Download PF Joint Declaration Form HERE. What If My Details Register With PAN Card Is Wrongly Updated? Sometimes, PAN card details can also be wrongly updated, If that happened, Then the member have to correct his/her name mentioned on his PAN card. Can I Update My PAN Card Details Online For EPF? Yes, you can make a correction in your details registered with PAN card online by using the online PAN card application form. Once you solve every issue related to your PAN details or your information registered in EPF Portal, You can able to solve PAN verification failed error in UAN. Previous articleEPF Claim Status – Payment Under Process? Next articleGovt. Can Increase The Pension Of EPFO Subscribers – Know How ! Can you please tell me how can I check my PF claim status? This was really helpful, I found what is was looking for. I’ve shared this information in my social networks. Did making these changes really worked for you? While uploading my PAN details in uan portal getting error station error,while pan authentication,could not sent message. Did your issue “Could not send message” get resolved ? Have you checked twice that your name in PAN is fully matched with your name registered with the UAN? Then this must be a technical issue from the other end. You should contact the EPFO Technical Team by emailing at employeefeedback@epfindia.gov.in OR you can file a complaint in the EPFO Grievance Portal for a quick action. Thanks for your help will try on the above given information. Error while PAN authentication. Could not send Message. Hi, The name is PAN card is in different format (Your name and expansion of your initial). But in UAN we have just our name and the initial which makes it not to tally. The pan card is already linked with AADHAR, Bank Info and other major criterias. do not know how to link PAN with UAN as if we change the name in PAN CARD now, it might create lot of difficulties. Kindly show some light on this EPF team. Pan details are not uploading in UAN portal for last 2 weeks.Its an constant error appearing and still not resolved by EPFO. Most of the EPF Subscribers are facing this issue nowadays. As per officials, there is some error in PAN Server and their Technical Team are working to solve the same. Kindly wait, or submit your complaint to the EPF Grievance Portal for a quick action. when the pan issue solve? We are getting so many queries related to this and According to the instructions issued by the Labor Secretary, complaints coming to Grievance Portal should not be pending for more than 7 days. So, we can expect this issue will resolve soon. I am so frustrated..please help.. In UAN & Aadhar initials are allowed but in Income tax pan number initial is expanded as First name so pan name & UAN name mismatch error occurs.Online EPF claim service is under maintenance comes for last four days.when the errors are rectified.Sir please help. Aadhar & Pan are linked successfully.In EPFO website KYC update Aadhar updated But pan name mismatch comes, In UAN & Aadhar initials are allowed but in income tax Initial is expanded as First name.How do rectify this error.Please clarify sir. The situation in which you’re in, Is still exist in most of the PF members and we’re trying to get as much information as we can. As per EPFO, this problem is due to some error in PAN Server and their Technical Team are working to solve the same. Kindly wait, or submit your complaint to the EPF Grievance Portal for a quick action. I am getting an error pan card verification failed(Name against UAN doesn’t match with the name in income tax department), so please tell me how to resolve this error. Please submit your complaint to the EPF Grievance Portal for a quick action. I am getting an error pan card verification failed. I want to avail advance withdrawal for medical treatment. I need 5000 thousand, will it affect TDS for this??? Please reply??? PF withdrawal amount is less than Rs50,000, TDS is not applicable. I am getting error while updating pan information, but after that I did pan name correction as per UAN member portal. it has corrected in income tax office also. but then also I am getting same error. so please advice what I can do for above error?